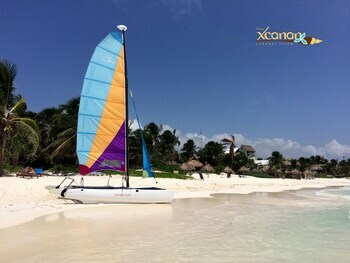 When you stay at Playa Xcanan in Tulum, you'll be on the beach and convenient to Tulum Beach. Featured amenities include a 24-hour front desk, luggage storage, and a safe deposit box at the front desk. Free self parking is available onsite. When you stay at B&B Playamar Centro in Playa del Carmen, you'll be near the beach and minutes from Mario Villanueva Stadium Madrid and Mamitas Beach Club. Located in Valle de Bravo, Hotel Casa Valle is within a 15-minute drive of Lake Avandaro and Velo de Novia Waterfalls. Free self parking is available onsite.